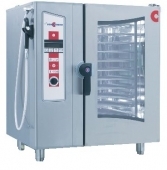 Below is additional information on the hire item "Convotherm 10 Rack Combi Steam Oven 415v". Description Convotherm 10 Rack Combi Steam Oven 415v. Requires hard wire or 32amp 415v commando plug fitting.